Preheat oven to 475°F. Coat a sheet pan lightly with olive oil. Season your steak with salt and pepper. Combine your veggies in a bowl and add your favorite seasonings (salt, pepper, garlic salt, etc.). Drizzle with some olive oil and then toss to combine. When the sheet pan is hot, lay the protein on (the hotter the pan, the better sear you'll get on your steak - see Jan's Note below). Lay the seasoned veggies right next to the protein (see Jan's Note below). Return the pan to the oven and cook until the protein and vegetables are cooked to your desired doneness. Soften butter just enough to combine the herbs, garlic, and salt. Mix them together, then spoon it into a container, or spoon the herbed butter onto parchment paper, cover it, and roll it into a log and chill in the freezer for 30 minutes, then slice! 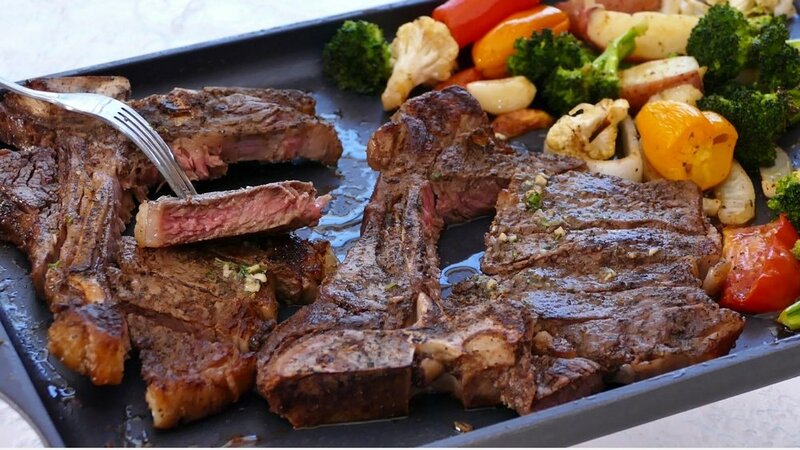 If you really want to make sure that your steak has a nice sear on the outside, you can cook your steak in a hot skillet to sear before finishing it off in the oven to desired temperatures. If using potatoes, cut them into wedges or smaller pieces and cook in the microwave for 2 minutes to soften. Then add them to the other vegetables.